The love you share goes beyond space and time; it is an infinite gift to cherish forever. Now, celebrate that love with a diamond bracelet truly worthy of your relationship: the spectacular Forever Love Diamond Bracelet, showcasing the exquisite beauty of diamonds in an exclusive fine jewelry design from The Bradford Exchange.Handcrafted and plated with shimmering silver, this stunning diamond bracelet features a unique shape inspired by the infinity symbol, its delicate curves boasting 18K gold-plated highlights. The bracelet is then set afire with the sparkling beauty of 12 genuine diamonds. 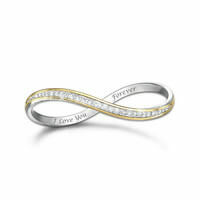 As the perfect romantic finishing touch, the inside of the bracelet is engraved with "I Love You Forever." What better way to express the infinite bond between you? But don't delay, strong demand is expected. Order now!